Welcome to the October issue of the St. Kitts and Nevis Beach Buzz. I must apologize for mailing out this newsletter a few days late. However, I trust that when you read all the great info that I have included in this issue, you will conclude that it was definitely worth the wait. If you follow the St. Kitts and Nevis travel forums at Discover St. Kitts Nevis Beaches and Myeyez, you may already know that we had two link up parties in October; one on October 12 and the other on October 25. 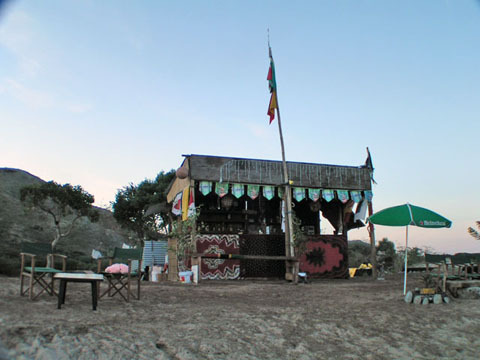 Both were held at Mr X Shiggidy Shack at South Frigate Bay and were a blast. For me, it was great to once again see forum members and friends (Karen, Alan, Mark and Cindy) whom I first met last year when we had our first link up at the Shiggidy Shack. It was also fun to meet other forum members including Anne, Bernie and Dragonfly for the first time. The mood at the link ups was similar to that of a gathering of family members and friends. I am certain that most people looking on didn't even realize that some of us were meeting up for the first time. 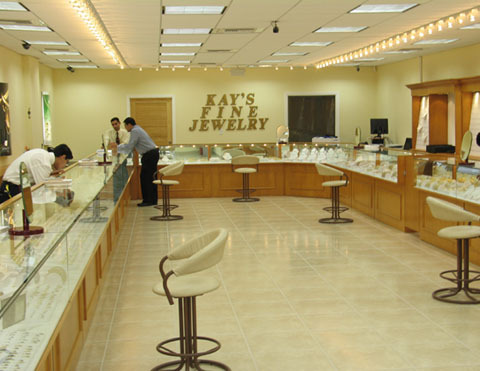 Anyway, for the link up party on October 25, forum member Vick of Kay's Fine Jewelry Store at Port Zante was kind enough to arrrange to take care of our bar tab and make a contribution towards the food. The link up also benefitted from Santa and Mrs Klaus' generosity. On behalf of all travel forum members and friends, I'd like to express my sincere gratitude to Vick, Santa and Mrs. Klaus. If you would like to link up with other forum members while you are in St. Kitts, please let me know when you will be on island so I can organize it. In closing, I'd just like to remind you to reserve your rental cars ASAP if you will be visiting St. Kitts during the Christmas and Carnival season. There is always a strong demand for rental cars during this season, and unfortunately, it is nearly impossible to get one at the last minute. So please don't wait until it's too late. If you have questions about renting a car here or you'd like assistance with making the reservations, please feel to contact me. Do enjoy this issue of the Buzz. Happy reading and viewing! PS - During the course of this month I will be launching a new form of trip reviews that I know you will enjoy. I can barely contain the excitement, I need to make certain that everthing is in order. I will announce the launch of the new service via my RSS news feed. I will also write about it in the next issue of my newsletter. Until then, stay tuned. Since the last issue of the St. Kitts and Nevis Beach Buzz was published, I upgraded the software used for the travel forum. Consequently, you will notice that the forum has a new look and feel. As some of you may have also noticed, the forum was moved from its old home at www.islandimage.com/cgi-bin/yabb/YaBB.pl to our server at www.discover-stkittsnevis-beaches.com/cgi-bin/travelforum/YaBB.pl. Please note this change in the URL/site address for the forum and make the necessary changes to your bookmarks. I will take the old forum offline permanently at the end of this year. The new forum offers many new and enhanced features (some of which I'm still familiarizing myself with) over the old forum software. Some of these features include an announcement board as well as a poll feature. From time to time, these features will be used to communicate important information to and solicit feedback from forum members and guests. Please remember to stop by the forum and join in our friendly discussions. I look forward to seeing you there. We have recently consolidated what used to be our St. Kitts and Nevis Travel News RSS feed and the What’s New at Discover St. Kitts and Nevis Beaches RSS feed into a single RSS feed. In a nutshell, RSS stands for Rich Site Summary or Really Simple Syndication. By using RSS, I will be able to keep you updated about new and revised pages on the web site whenever there is a change, without you having to visit the website. This is made possible through the use of RSS news readers or RSS enhanced services from Yahoo, MSN or Google. To find out how to subscribe to our new Discover St. Kitts and Nevis Beaches site RSS feed, read more about what is RSS here. As part of the continued development of the web site, I wish to announce the launch of our photo albums at http://www.discover-stkitts-nevis-beaches.com/photoalbums. From this page, visitors to my site will be able to link to themed albums featuring photo tours and stories about beaches, historical attractions, activities and scenes from around St. Kitts and Nevis, among others. If you are a member of my St. Kitts and Nevis travel forum, you will be pleased to know that the photos from the travel forum link up parties will form a part of these albums. In fact, because we had so much fun at the most recent linkup at Mr X Shiggidy Shack on October 25, 2005, I have decided to use the album from the October 25 link up party to mark the launch of the DSKNB photo albums. I hope you will enjoy viewing our photo albums, and that browsing through them will bring back many happy memories of your time spent in St. Kitts and Nevis. St Kitts Trip Review – Excellent! The visit of the RCCL Empress of the Seas on Saturday, October 17 marked the start of the 2005/2006 cruise ship season. 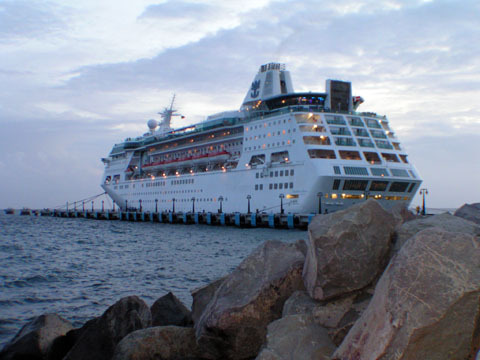 The Empress of the Seas is expected to make twenty calls to St. Kitts during this season. The cruise ship called on Port Zante for the second time this season on Saturday October 22. On Tuesday October 25, MS Veendam from the Holland America Line made an unscheduled visit to St. Kitts after being diverted as a result of Hurricane Wilma. Mr. X of Mr X Shiggidy Shack is the new operator of the beach water taxi previously operated by Atlantic Waves Safaris. The water taxi offers a convenient and fun way for cruise ship passengers to be transported to the popular beaches on St. Kitts. Last time I checked, the round trip fare to South Frigate Bay or South Friars Bay was US$15. To book the water taxi, visit their booth in the arrivals hall at Port Zante. In addition to the water taxi services, Mr. X plans to offer a range of water based safaris including snorkelling and scuba diving tours, deep sea fishing trips, day and half day cruises to Nevis as well as sunset cruises along the Southeast Peninsula coast for the upcoming tourism season. The 2005 Tourism Week in St. Kitts is being celebrated from October 29 to November 6 under the theme “Preparing to Welcome the World”. This year’s activities will focus on opportunities for careers in tourism, development of the tourism product, re-training, re-educating and re-emphasizing the need for input from all. Some of the activities to be held during the week will include Tour Operators Symposium; Craft Vendors Seminar; Craft Producers Workshop; Restaurant Workers Seminar; Visual Arts and Craft Exhibition and Tourism Careers Exposition (November 3 from 11:00 AM to 6:00 pm ) at the National Museum; Food Fair and Tourism Marketplace(11:00 AM) and Pan Festival (5:00 pm ) on November 4 at Independence Square; Awards Banquet (November 5 at St. Kitts Marriott Resort) and Oceanfest and GEM Radio Rave (11:00 AM November 6 at South Frigate Bay Beach). The date for the 2006 10th Annual St. Kitts Music Festival has been announced. It is June 29 to July 2, 2006. The festival is normally held during the last weekend in June. However, for the tenth anniversary, the festival has been pushed back to one week later. This is being done to accommodate the June 22 to 26, 2006 cricket test match between West Indies and India, the first test match ever to be played in St. Kitts and Nevis. The match will be played at the new Warner Park Cricket Facility. Bob & Elvis, the St Kitts Party Bus will be officially launched at the Tourism Week Food Fair and Tourism Marketplace on Friday November 4 at Independence Square. The operator of the party bus is throwing out a challenge to you to hop on and go local with them on a party going, bar hopping, nighttime experience. 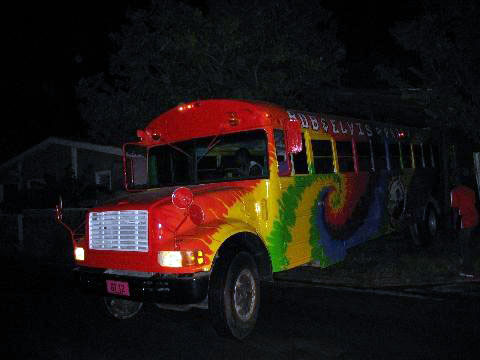 Join the ride on this Thomas International modified school bus, that promises to be the ultimate party experience if you are just looking to kick back and have a night of hassle free fun. 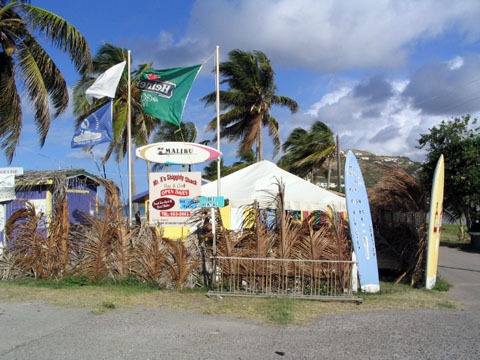 This bar hopping experience on wheels will take you to some of the most inviting bars and pubs on the island of St Kitts. It will start off with a sunset champagne experience on the Southeast Peninsula. The on board bar will provide unlimited portions of the house special: a “Purple Mu Foo” from the bar that never closes. Off the bus one (1) complimentary beverage is provided at each stop and a sumptuous dinner is served at a choice restaurant. Bob and Elvis - The Party Bus is equipped with a commercial PA/CD 1000 watt sound system for the latest in dance and Caribbean music. You can't afford to miss the bus, the Bob & Elvis St. Kitts Party Bus. Make your enquiries and bookings here! The annual Carnival Celebrations for St. Kitts will be launched during the Tourism week celebrations on Friday November 4. Carnival will run from December 17, 2005 to January 4, 2006. This year, the Carnival Committee is headed by newly named Chairman Gus Williams. The St. Christopher Heritage Society will hold its Annual Fundraising Take-Away Dinner in the Archway of the National Museum on Friday November 4, 2005 from 7:00 - 9:00 pm. If you wish to stay and have your dinner at the event, tables and seating will be available. A bar and entertainment will be provided. Tickets cost EC$25 and are availabe at the officies of the St. Christopher Heritage Society and from Council Members. As a SCHS Council Member, I have tickets available for sale. The Unusual Annual Heritage Raffle will be drawn at 9:00 pm. 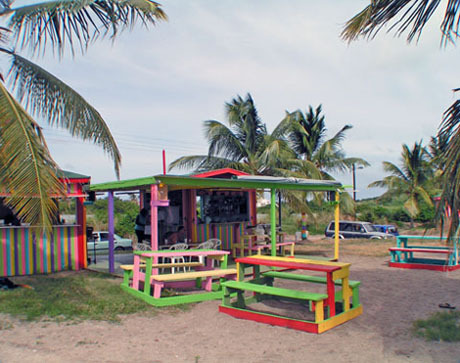 The Rainbow Beach Bar and Grill located in the middle section of South Frigate Bay Beach is an action spot on Sunday afternoons. Live music provided by DJ Fresh from 4:00 PM until 2:00 AM. If you are looking for a fun way to spend your Sunday afternoon, head on over to the Rainbow Beach Bar and Grill and rock the beach with the one and only DJ Fresh. If you have a special request just name it and he’ll play it for you. Mr X Shiggidy Shack will be the place to be on Guy Fawkes night, Saturday, November 5. The celebration will get started from about 6:30 PM and will go until the last person leaves. This is a great opportunity to spend time with family and friends in festive surroundings, as you light off your fireworks. The highlight of the evening will be a massive fireworks display put on by the Shiggidy Shack. If you are in St. Kitts during this time, make sure you head on over to Mr X Shiggidy Shack on South Frigate Bay Beach on the night of November 5. The Shack also serves up some great tasting food, so just in case you’re wondering where to have dinner on that night, you may want to consider having dinner there while you sit and watch the fireworks. The action at Mr X Shiggidy Shack is not restricted just to Guy Fawkes night. In fact, the Shack is a regular action spot. There is live music, a bonfire and fire eating by Gary the fireman on Thursday nights starting at 7:00 PM. On Saturday nights there is karaoke that gets started from about 9:30 PM, while on Sunday nights live entertainment takes over the "Shack"from about 7:00 PM. There is also a full moon party every full moon. Oasis Sports Bar and Grill will rock with action in November. The action gets started on November 5 with the GEM radio Pre – Rave Party and fireworks. Admission is EC$20.00. 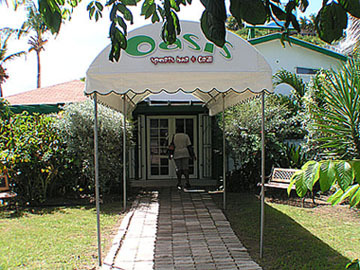 Then on November 11, The Legends Calypso Tent will be held at Oasis. There will be a special price of EC$3.00 on all the local beers. The action continues on Saturday, November 12 with a show at 9:00 PM featuring Rachel Price, the fabulous comedian out of Trinidad and Tobago. Admission for the show is EC$30.00. If you are not into comedy, then you can check out the pay per view boxing on the inside featuring Klitschko vs Rahman. Latino dancing will be in the spotlight on November 18 at the Latino dancing competition. The following night, November 16 is dubbed Scorpio’s Party. If Scorpio is your Zodiac sign then you’ll be in for a treat. Free admission and a free Oasis Shot will be offered to all Scorpios. From 10:00 PM on November 25, local sound systems Tombstone International and DJ Yardie will be in the house to rock you with Tidal Invasion. To close out the November action at Oasis Sports Bar and Grill, the Legends Calypso Tent will return on November 26. Don’t miss this chance to hear the calypsonians vying for a spot to advance to the calypso competition phase for the 2005/ 2006 Carnival. I recently discovered that the Major's Bay Beach Bar operated by Bucky was destroyed by fire about three weekends ago. 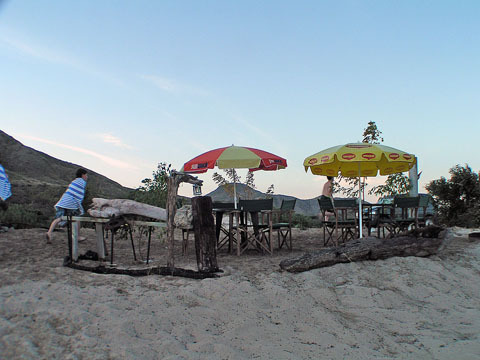 When it was around, this beach bar was one of my favorite hang out spots, mainly because the area was so serene. The beach there was also very calm. 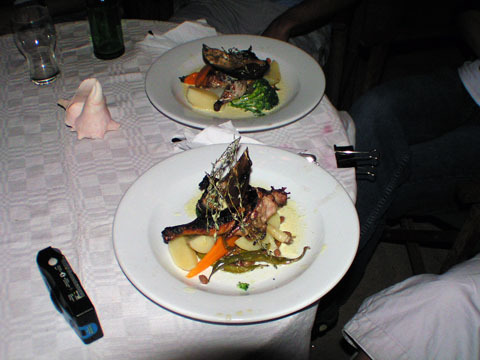 I enjoyed a few gourmet dinners there while sitting under the stars with my toes in the sand. The bar was a favorite with the yachtsmen who anchored their yachts in the protected anchorage at Major's Bay. I was fortunate to meet some of them from as far away as France, who were just blown away by the serenity of the surroundings and Bucky's cooking. For those of you who never had the chance to visit the Major's Bay Beach Bar when it was in operation, the following photo story is meant to give you a glimpse of the beach bar prior to it being destroyed by fire. 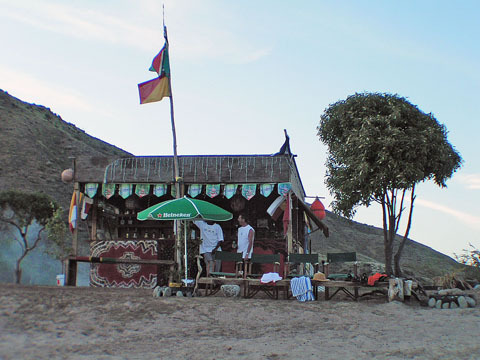 Major's Bay Beach Bar which was operated by Bucky prior to being destroyed by fire. Bucky was very creative with the layout of his dining area. The above shows one of the configurations, but the area offered trememdous flexibility. There was always something new to see at the bar. This photos shows the addition of a covered area in front of the counter. The covering was made from coconut branches weaved together. 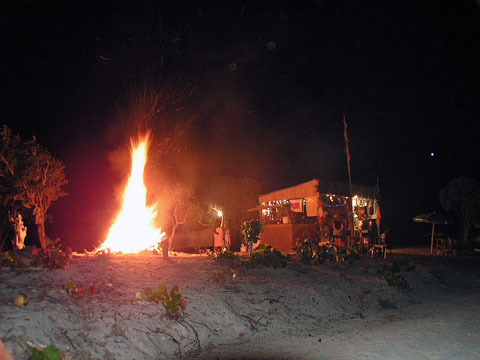 A bonfire was a regular feature at Bucky's Major's Bay Beach Bar. 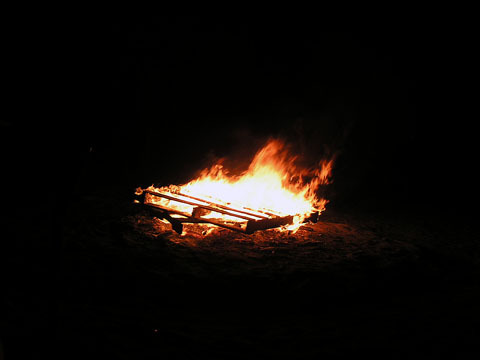 In this photo, the bonfire burns in the foreground casting a red-orange hue on the bar in the back. 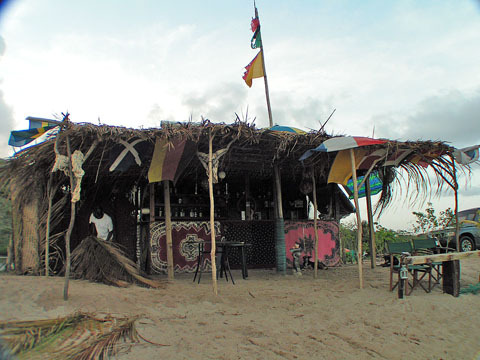 Major's Bay Beach Bar in it's early days, prior to being destroyed by fire. Bonfire burning at Majors Bay Beach Bar in St. Kitts. Grilled chicken leg and sauteed vegetables prepared by Bucky. 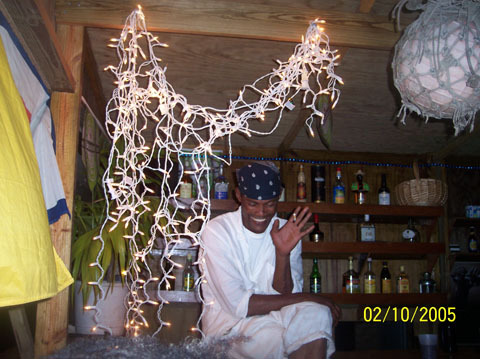 Bucky, owner/chef of the Majors Bay Beach Bar, takes time out to pose in front of the bar for this photo. Yet another gourmet dinner prepared by Bucky. 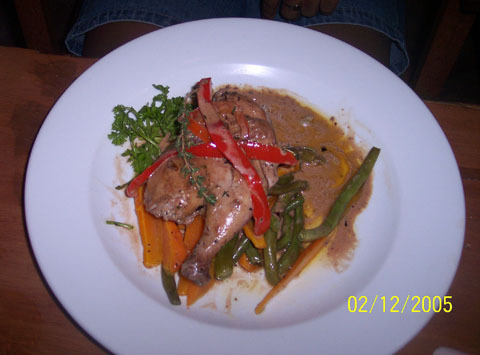 This time grilled cornish hen in a cream sauce (one of Bucky's creations) served with sauteed vegetables. "I've found your site extremely helpful and am thankful that I discovered it!" "What a great website! full of information, and the pictures look lovely." "Great web page thank you for taking the time to do it." "I just found your site and I want to congratulate you on the superb job you did putting this site together. It is very informative and the pictures are beautiful. I will definitely recommend this site to the many people that contact me with questions about St. Kitts." Liz Pereira, the helpful travel consultant and St. Kitts Specialist who also assists me in moderating the St. Kitts and Nevis Travel Forum at Discover St. Kitts and Nevis Beaches.com, e-mailed me to let me know that prices on the non-stop charter from Toronto to St. Kitts have been reduced for the following dates: January 12-19 and January 19-26. If you live in Canada and would like to fly on down to St. Kitts and Nevis, please contact Liz now and let her know. These special fares go quickly so make sure you reserve yours now. That's all for this issue. Please remember to drop me a line if you have any comments or ideas you’d like to see added to my site. Do grab a Carib, Stag, CSR and Ting or your favorite Brinley Gold blend and sit back, relax and get ready to ‘Catch de Buzz’... the St. Kitts and Nevis Beach Buzz.